Last week, we tried a new recipe that I saw while browsing through Sarah's blog, Frugal By Choice, Cheap By Necessity. I don't quite remember how I happened to stumble across her blog, but the name intrigued me since I'm constantly searching for frugal tips and ideas. I certainly wasn't disappointed! 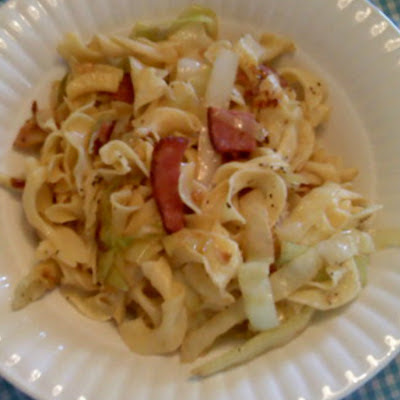 After reading her Polish Cabbage Noodles recipe, I knew I wanted to try it. After reading that it made a ton, I wanted to try it right away and added a head of cabbage to our shopping list! Joe and I love cabbage, we just don't eat it as often as we should. As much as we enjoy it, I just tend to forget about it. I really need to find more cabbage recipes so we can enjoy it more often! In addition to making a ton and being very tasty, this recipe is also frugal and super-easy to make! Also, it can be used as a side dish or even as a main dish! I followed the recipe almost completely, but just as I started to prepare dinner, I decided to add some turkey bacon to the pan! Mmmmm! Saute cabbage and onion in 1/4 cup butter over medium heat, salt & pepper to taste. When the veggies are tender, add the diced turkey bacon and continue cooking until bacon is done. Add in cooked noodles and 1/4 cup butter, stirring until well-combined and butter is melted. This made 4 main-dish servings, which for us is two nights' dinners! While we enjoyed this a lot the first night, it tasted better the next night! The flavors were better combined after being stored in the fridge overnight! suggests adding hot sauce and garlic salt and I agree. I forgot to grab the garlic salt from the pantry and decided to leave it out. The recipe was tasty without it, but since we love garlic, I'm sure it will be extra yummy with the addition! I'm thinking red pepper flakes would be a good addition as well. I added turkey bacon since I had half of a package in the fridge. Ham or even kielbasa would be also be perfect added to this dish. See? Easy right? Frugal right? Heck, it's down right CHEAP!!! I'll be preparing this again! I've never heard of adding cabbage to noodles, but this sounds very good, especially with the addition of the bacon. Thanks so much for sharing your recipes with me at Your Cozy Home Party! We just love this dish and your recipe looks awesome! Hope you are having a great week end and thank you so much for sharing with Full Plate Thursday. Looks yummy! My grandmother's family is from Poland, so I bet this is the kind of dish they used to eat. I will have to try it! Looks yummy! Thanks for linking up with Frugal Food Thursday at Frugal Follies! The new linky is up so please come link up your latest recipes! I made this for supper last night! Thanks for sharing the recipe!